An increased focus on antibody titers raises questions concerning the indications for performing titers, titer interpretation and limitations, and the role of titers when making vaccination decisions for patients. The publication of vaccination guidelines for dogs and cats (see Links to Vaccination Guidelines)—intended to provide useful insights on the selection and use of vaccines—also elicited some degree of controversy regarding implementation of these vaccination recommendations in practice. In particular, the recommendation to administer core vaccines to adult dogs and cats at 3-year intervals (or longer) rather than annually resulted in differences of opinion among veterinarians. After all, veterinarians have been recommending annual boosters for years, doing so in accordance with manufacturer recommendations. Therefore, the growing group of veterinarians who were skeptical of triennial vaccination recommendations began measuring antibody titers from individual patients to assess duration of immunity (DOI) and determine whether a patient required revaccination. As demand for vaccine titers increased, veterinary laboratories began offering antibody titer panels for dogs and cats while 2 companies developed in-clinic antibody tests. What are the indications for performing titers? When interpreting antibody titers, what test limitations apply? How should test results be interpreted when making vaccination decisions for individual patients? How well does a positive antibody titer (or test kit result) correlate with protective immunity in a patient? How well does a negative titer (or test kit result) correlate with susceptibility in a patient? The only true test of protective immunity involves exposure (challenge) to a virulent pathogen in which nonvaccinates (controls) are infected and manifest clinical illness while vaccinated animals remain healthy. Animal vaccines are licensed based on this premise. Interpreting antibody test results depends on understanding what results do and do not represent. In the clinical setting, antibody levels offer diverse and distinct clinical applications (see It’s All About PIE). Different classes of antibody, also called immunoglobulin (Ig), have specialized functions (identified and categorized as IgA, IgG, IgE, or IgM). In veterinary medicine, the antibody titers used to assess protective immunity typically represent the IgG class. 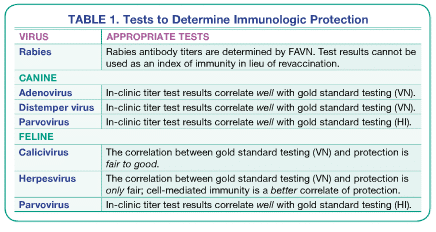 When using an in-clinic test kit to measure (qualitative or semiquantitative) antibody levels, results are reported as either positive (indicates protection) or negative (indicates susceptibility) and must be correlated with gold standard laboratory tests, such as virus neutralization (VN) or hemagglutination inhibition (HI), in order to accurately represent a defined threshold of antibody. Both in-clinic tests have been correlated through VN, HI, or challenge testing results. While the correlation studies were conducted independently through universities, the data is available through the respective companies that manufacture the in-clinic test kits. A positive test result indicates the patient does have protective levels of antibody against the virus. A negative test result indicates the patient does not have protective levels of circulating antibody. However, a negative test result does not necessarily define susceptibility. Protection (P): Some, but not all, antibody results correlate well with protection (eg, canine and feline parvovirus). A patient with a positive titer or test result for parvovirus antibody can be considered protected. Infection (I): On the other hand, antibody presence can represent evidence of active infection (eg, feline immunodeficiency virus). Exposure (E): Other antibody test results indicate prior exposure to an infectious agent (eg, Ehrlichiosis) or vaccine (eg, rabies) and do not predict either protection or active infection. Seroconversion, the antibody response that follows vaccination, can be identified for most vaccines administered to dogs and cats. However, the development of antibody does not necessarily equate to protective immunity. Even if antibody test results are positive after feline herpesvirus (FHV) and feline calicivirus (FCV) vaccination, results do not correlate well with protective immunity; these results are not generally recommended for use when making vaccination decisions for an individual cat. The correlation between the gold standard antibody test for FHV-1 (VN) and protection is only fair; cell-mediated immunity is a better correlate of protection against FHV-1. The correlation between the gold standard test for FCV (VN) and protection is fair to good. Rabies antibody titers, as determined by fluorescent antibody virus neutralization (FAVN), are only available through a limited number of certified laboratories. It is important to note that a rabies virus antibody titer cannot be interpreted as an index of immunity in lieu of revaccination. If a client would like to determine whether a young dog/cat responded to the initial vaccination series (usually 3 doses), in-clinic test kits provide an excellent means of identifying those that did respond versus those that did not and, therefore, remain susceptible. For veterinarians faced with treating confirmed parvovirus infection in a well vaccinated dog or cat, antibody testing can be used to rapidly determine whether the affected animal developed a protective immune response following the initial vaccination series. A positive antibody test suggests the vaccinated patient was infected during a period of susceptibility (eg, in the presence of MDA). Patients with a negative test result are likely to be susceptible (genetic) non-responders (or low-responders). The antibody test does not distinguish vaccine-induced seroconversion from that caused by infection. For patients with a history of a known, or suspected, serious vaccine adverse event (reaction), evaluating the level of antibody will determine whether the patient has previously developed a protective immune response to vaccination. Patients with a positive test result can avoid revaccination and potential risk for an adverse event. Among previously vaccinated animals, immune memory (B-lymphocytes) can be sustained for many years despite declining antibody levels; exposure to a pathogenic virus (eg, distemper or parvovirus) can result in a rapid and protective anamnestic response. Prior history of a vaccine adverse reaction is not predictive of future risk. Immunization may not be optional, regardless of the antibody status of the individual (eg, rabies). Clientele who have adopted an adult dog/cat that has no known vaccine history may elect to avoid vaccination if a protective level of immunity can be determined serologically. International guidelines for administration of core vaccines to adult dogs and cats consistently recommend revaccination schedules of no more often than every 3 years for core antigens (CAV-1*/CDV/CPV and FCV/FHV/FPV). However, with regard to rabies vaccination, veterinarians must follow state or local laws. Immunization status of young animals presented to animal shelters is often unknown. Because the infection risk among shelter-housed dogs and cats is high, determining antibody status of an animal at time of entry allows vaccination and separation (foster) of animals deemed susceptible until a positive test result is obtained. Antibody test kits offer shelters a management advantage when faced with an infectious disease outbreak involving CDV, CPV, or FPV. Identifying and separating animals with positive (protected) test results from those with negative (susceptible) results may help avoid unnecessary euthanasia. When feasible, susceptible animals should be isolated from the general population, which limits propagation of the outbreak. Isolated, seronegative survivors can be placed or adopted once the incubation period for the infectious agent has passed (2 weeks for CPV and FPV; 6 weeks for CDV). *All antibody tests detect antibodies against CAV-1; however, the vaccine antigen protects against CAV-2 (a respiratory pathogen), which also cross protects against the more serious, systemic CAV-1 (canine hepatitis virus). A positive antibody test result in an unvaccinated, but healthy dog or cat suggests prior exposure to and recovery from infection; the patient has protective immunity. A positive antibody test result in a previously vaccinated dog or cat correlates well with protective immunity. A negative antibody test result in a previously vaccinated dog or cat must be interpreted on the basis of age and prior vaccination history. Negative test result in protected patient: Over time, antibody levels in a previously vaccinated adult dog or cat that is not revaccinated (or naturally exposed) may fall to negative levels. Memory cells (B-lymphocytes), however, can persist longer than antibody. Exposure to virulent virus is expected to rapidly boost the patient’s antibody response and protect. Negative test result in susceptible patient: A puppy or kitten that is antibody negative following administration of initial core vaccine series is considered susceptible to infection if exposed. These patients may be (genetic) non-responders (or low-responders) or received the vaccine during a period when interfering levels of MDA were present. Current vaccination guidelines recommend administration of the last dose of core vaccines at 14 to 16 weeks of age in puppies and 16 weeks of age in kittens. Antibody titers may be determined as early as 2 to 4 weeks following completion of initial vaccination series. A puppy or kitten that is seronegative at 18 weeks of age should be revaccinated not less than 2 weeks following the last dose. Antibody testing can then be performed as early as 2 weeks following administration of this last vaccine dose. Greene CE, Levy J. Immunoprophylaxis. In Greene CE (ed): Infectious Diseases of the Dog and Cat, 4th ed. St. Louis: Elsevier-Saunders, 2012, pp 1163-1205. Greene CE, Vandevelde M. Canine distemper. In Greene CE (ed): Infectious Diseases of the Dog and Cat, 4th ed. St. Louis: Elsevier-Saunders, 2012, pp 25-42. Gill M, Srinivas J, Morozov I, et al. Three-year duration of immunity for canine distemper, adenovirus, and parvovirus after vaccination with a multivalent canine vaccine. Intern J Appl Res Vet Med 2004; 2(4):227-234. Schultz RD, Conklin S. The immune system and vaccine challenges for the 21st century. Comp Cont Ed Pract Vet 1988; 20:5-18. Schultz RD, Ford RB, Olsen J, Scott F. Titer testing and vaccination: A new look at traditional practices. Roundtable Discussion. Lenexa, Kansas: Veterinary Healthcare Communications, 2002, pp 1-16. Twark L, Dodds WJ. Clinical use of serum parvovirus and distemper virus antibody titers for determining revaccination strategies in healthy dogs. JAVMA 2000; 217:1021-1024. Waner T, Mazar S, Keren-Kornblatt E. Application of a dot enzyme-linked immunosorbent assay for evaluation of the immune status to canine parvovirus and distemper virus in adult dogs before revaccination. J Vet Diagn Invest 2006; 18(3):267-270.